Intro 2020 is now the official UK distributor of Tokina Cine Lenses. The product range currently consists of 2 lenses, with further lenses and cinema filters to follow by the end of the year. This model is based on the highly innovative Tokina AT-X 16-28mm F/2.8 PRO FX HD SLR. It has been fully converted to a cinema lens and fits Super 35mm cameras as well as cameras with APS-C and smaller sized image sensors. The 16-28mm zoom range offers the freedom to capture a super wide-angle of view of a scene while still maintaining a tight perspective. The 16-28mm has a 56mm large-diameter aspherical element in addition to two more molded-glass aspherical elements within the lens, and three elements of SD (Super-Low Dispersion) glass installed in the rear optical groups. Optical design and use of special materials yields high 4K lens construction and control of both spherical and chromatic aberration. LDS (Lens Data System) support is possible. Durable, all-metal cine-style housing with geared manual zoom, focus and aperture rings for use in follow-focus systems. Common 114mm front diameter for use with a wide variety of matt boxes and accessories. Smooth de-clicked curved 9 bladed iris. Zoom, focus, and iris marking are on both sides of the lens for easy viewing and more mounting/follow-focus options. 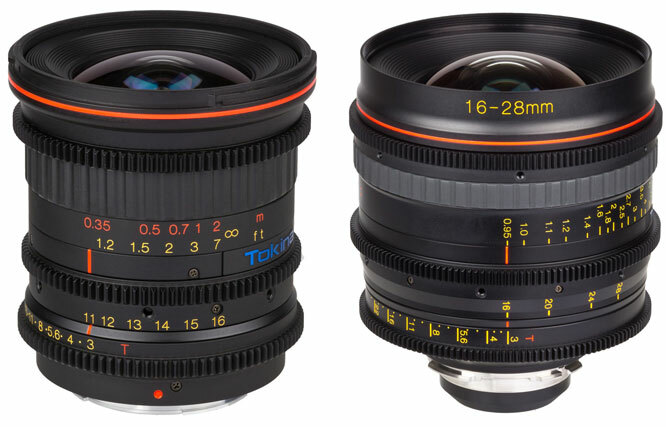 Proven wide-angle optics have been converted to an 11-16mm T3 cinema lens for use with APS-C, Super 35 and smaller image sensors. Two SD (Super-Low Dispersion) glass elements and two aspheric lenses allow our proprietary optical design to achieve excellent contrast. 4K image sharpness and well controlled chromatic aberration. Durable, compact, all-metal cine-style housing with geared manual zoom, focus and aperture rings for use in follow-focus systems. The size of this lens adds to its versatility. The petal design BH-77A lens hood stays securely in place due to the click-lock mount. Mounts to Canon EF, Micro 4/3. Visit the Tokina website for more information.